You are here: Home / Weekly Columns / Opinion / Apple Watch Series 5 Features Reveal Apple’s Secret Plans. 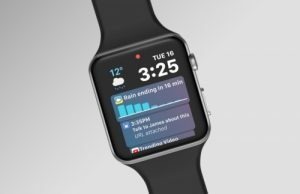 (ThyBlackMan.com) The Apple Watch Series 5 is already making headlines even when there is no confirmed release date for the smartwatch. Apple Watch is the leader in the smartwatch market with a 51 percent share in the global market. In the fourth quarter of 2018, smartwatch shipments (global) reached 18 million units. It means that the overall growth in the year was 56 percent. At present, Apple holds the first position in the global smartwatch market and Samsung has secured the second position by overtaking Garmin and Fitbit. To make its smartwatch another bestseller, Apple is rumored to be working on many new features. The most anticipated Apple Watch Series 5 features are sleep tracking, electrocardiogram (ECG), always-on display, a wide range of apps and watch faces. Although ECG feature was introduced with the Watch Series 4, it is still limited to U.S. markets only. However, Apple has already confirmed that the company will release this feature in other countries as well. The possibility of sleep tracking feature is something people are talking about a lot these days. If the Apple Watch Series 5 features sleep tracking system, it won’t be a new thing in the world of wearables. Fitness tracking devices from Xiaomi and other companies come equipped with sleep tracking features and some of them work really well. If Apple plans to add this feature, this is how the Apple Watch Series 5 will work. The smartwatch on your wrist will detect movements. Sensors will then send this data to the software. So, the Apple Watch Series 5 will be able to detect the amount of sleep and the quality of sleep. Now the quality of sleep is usually determined by two factors – deep sleep and light sleep. Based on the data collected by the watch, you will be notified about the same. There are different opinions about the accuracy of this data. Experts suggest that people can’t completely rely on a sleep tracker because movements of the body are not always the same and throughout the night, people move their arms while their body sometimes stays in the same position. Another challenge for Apple would be related to battery life. Sleep tracking feature will certainly require more battery power, and users of the current generation of Apple smartwatches are still struggling due to poor battery performance. If the Apple Watch Series 5 features sleep tracking capabilities, the good thing is Apple will likely add more battery power to its new watch. Additionally, the new Apple Watch is rumored to support always-on display feature. At present, you can activate display by certain tricks like raising your wrist and tilting it, by rolling the crown upwards, or with a gentle tap on the display. So, as you can see there are many reliable ways to do it, the always-on display feature will make the experience better. The rumored list of Apple Watch Series 5 features also talks about support for new third-party apps and watch faces. The latest range of Apple Watch already supports applications of popular social media platforms including Instagram, and we’d like to see more apps on watchOS. Apple has also made changes in the watch faces and with the new Watch Series 5, Apple could allow more third-party watch faces on its platform. With that, we would like to see these watch faces bringing more useful information on the screen. Some smartwatch enthusiasts are expecting a change in the overall design of the new Apple Watch. Although the Apple Watch Series 4 was different from the previous Apple Watches, the overall design was still the same. However, the screen is bigger offering more screen space. In the previous three Apple Watch models, we saw that Apple didn’t make any big changes, so we expect Apple to keep the Watch Series 5 design unchanged.